newtwn_HDR_IMG_8317_19.jpg, originally uploaded by Mitch Waxman. 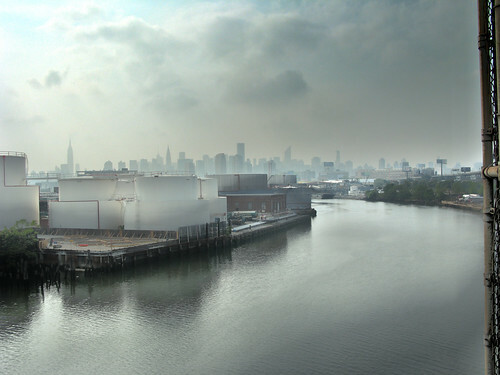 Newtown Creek has long been home to the oil and petroleum industries. Famously, the underground Greenpoint oil spill is the largest in U.S. history and can be tied back to John D. Rockefeller‘s Standard Oil (now Exxon). The extent of contamination by oil, however is just the tip of the iceberg. 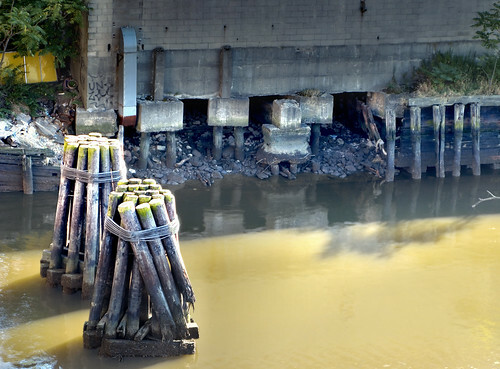 A quarter of New York City’s raw sewage is dumped directly into the creek. It mixes with 19th century pollutants like coal tar and naptha to form what Bernie Ente calls “Black Mayonnaise”. Estimates say that there’s anywhere from 10-20 feet of this unctious ooze coating the bottom. The waters of the Creek aren’t a death sentence, just a multi day stay in the hospital for a course of broad spectrum antibiotics. In the early 1990s, New York State declared that Newtown Creek was not meeting water quality standards under the Clean Water Act. Since then, a number of government sponsored cleanups of the creek have taken place. The New York City Department of Environmental Protection has sampled sediment and surface water at a number of locations along the creek since 1980. 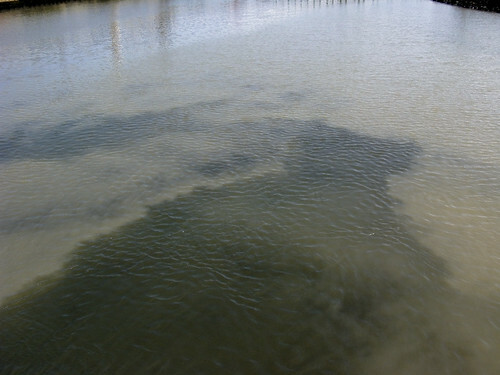 In 2009, EPA will further sample the sediment throughout the length of Newtown Creek and its tributaries. The samples will be analyzed for a wide range of industrial contaminants. EPA will use the data collected to define the nature of the environmental problems associated with Newtown Creek as a whole. During the 1970’s, there were fears that a casually tossed cigarette would ignite the water. Newtown Creek at The Greenpoint Avenue Bridge, originally uploaded by Mitch Waxman. Before I say anything else, I must acknowledge the massive scholarship of a fellow named Bernard Ente on the subject of the creek. A photographer and historian, Bernie is a central cog in the community of environmentalists, activists, and bloggers who wander the 3.5 mile long industrial waterway which separates Brooklyn and Queens. Mr. Ente can be found via the Newtown Creek Alliance ( http://www.newtowncreekalliance.org/ ) and is possessed of an encyclopedic knowledge of Newtown Creek’s long history. instead, I will just say that the smell is cyan colored, with hints of yellow. More to come. What is “The Newtown Pentacle”? The colonial era towns of Green Point, Brooklyn and the Queens towns of Astoria, Ravenswood, Hunter’s Point, Bowery Bay, and Middletown were called Newtown in Dutch and English times. In the early 19th century, the Queens villages combined to form Long Island City. The industrial center of the area was and still is Newtown Creek. The most polluted body of water on earth, this ancient inlet was once home to the Maspaetche Indians. Dutch Orchards and English farms gave way to Yankee rail and then Standard Oil as time went by. Today, its waters are a curious shade of copper green, and the largest oil spill in history gurgles back and forth through deep subterranean channels between Green Point and Long Island City. The architecture of the place is disturbingly heterogeneous. A rough tumble of styles are represented in this area — 19th century wrought iron row houses predominate, but 18th century warehouses are still on active duty in some places.Near Hunter’s Point and in Old Astoria, Antebellum mansions abut hideous Le Corbusier-influenced modernism. To the south and the east can be found some of the most interesting stone work in New York City as one explores the cemetery belt along the Brooklyn and Queens border. Three million New Yorkers lie in Calvary cemetery alone. In this, the Necropolis of New York City, the living population of Queens is outnumbered three to one. After a health scare a couple of years ago, my doctors recommended a course of clean living and regimen of physical exercise as the best curative. An amateur antiquarian and connoisseur of odd information, I elected to use my prescriptive exertions as an opportunity to explore and record. I toured crumbling Long Island City, the tree lined lanes of Victorian Astoria, and rusty coastlines of foetid Newtown Creek. Headphones on, camera in hand. The journey has taken me to many odd and forgotten places, and led me to discover a fascinating group of people. Follow me on these long walks, I promise you’ll see something amazing.